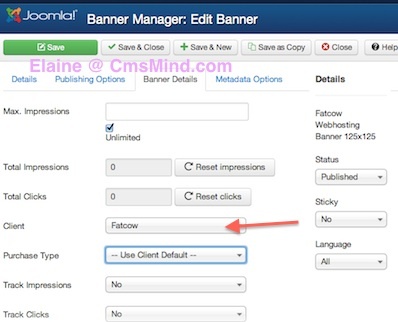 Joomla 3.0 Tutorial on How to insert a banner into Joomla 3.0. Each Banner must belong to a Banner Category. A Banner can only belong to one Banner category. You can create as a many Banner Categories as you want. There is an additional field which is called the Banner Client. This is useful because you can create multiple Banners for a customer/client/business and place them under a category. For example, Fatcow is a webhosting provider that provides me with many banners. 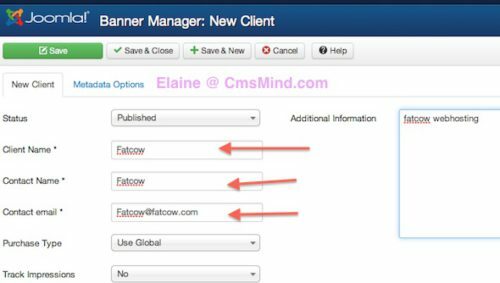 I will create a Banner category called Webhosting, a Banner Client = Fatcow and create a Banner for Fatcow. I can create many banners for one client that belongs to one category. To create new banners in Joomla 3.0, you must go to the Banner Manager in the Components section. Each Banner must belong to a category. That’s why we will create a Banner Category first. 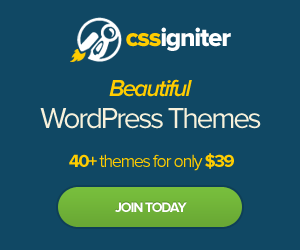 A Joomla 3.0 Banner must belong to a Banner Category. It cannot belong to more than one category. In my example, I will create a Webhosting Banner Category. You can create any category you want. Enter in the Banner Category details. You can enter in any category details that suits your website. While it is not mandatory that a Banner is associated with a Banner client, I think it is best practice to assign each banner to a banner client. This will group and organize all your banner clients. Joomla Banner Client is equivalent to a company who you are showing the banners for. They are the business or website you are promoting. In my case, my client is Fatcow. I will create a new Banner Client called Fatcow. 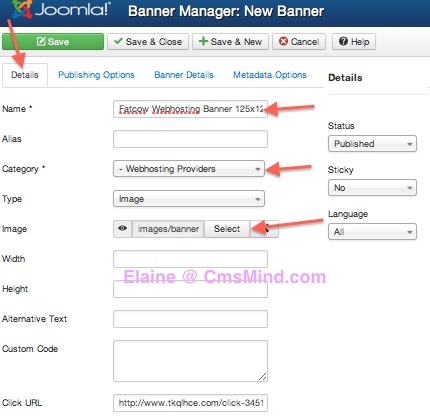 Now you can create a new banner in Joomla. Now you can insert a new banner in Joomla 3.0. You have a category and client setup already and you will not have any problems saving a new banner. If you do not have a category created, you will not be able to save your new banner. I am inserting a new banner for fatcow and the image is 125×125. I can potentially add more banners that have different sizes to this client. You can also select the Banner Client to which this Banner belongs to. This is not a mandatory field. I’m assigning a Banner Client to my banners. 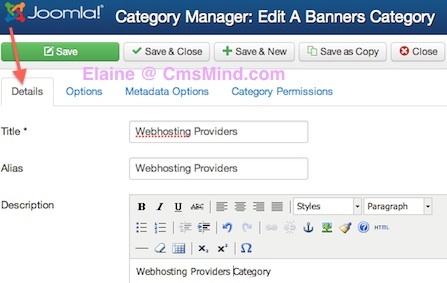 You can repeat the above steps to create more banners and create different banner categories. Then you will be able to create Banner Modules to display rotating banners on your Joomla 3.0 website. Hope that helps you. Please leave a comment if you have any questions. I use Joomla 3.2. + Beez3 + personal view. I´d like to wrap the site-description-text(set in Temp Manager) in the header, around my logo. Now the text flows around in the line below the image. How would you make the description-text flow from the top-right-corner of the logo? I take it as for granted you can hit my link to my site to se what I mean.